The first cabinet you put in is fairly easy but it is super important that it is level so that all the rest of the cabinets will line up. You want to put it in place and then check the levelness by placing your level from one corner of the cabinet to the opposite corner. 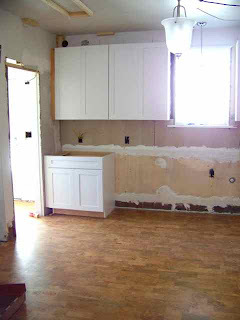 If it is not level, use shims to raise the cabinet on the appropriate side until it is level (don't worry if the shims stick out). Then do the same for the opposite diagonal. Once both of those are level, you can check the levelness from side to side and front to back but if you've done the diagonals correctly, those should be level. 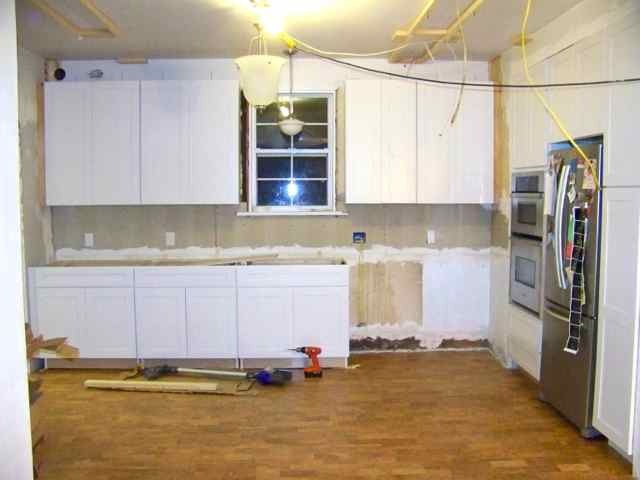 If everything is level, you can screw the cabinet into the wall (into studs)... just make sure you don't jostle the cabinet during this process! This should secure it in the correct position. The following cabinets are installed in a similar way but you also have to make sure the top of the first cabinet is flush with the next one. 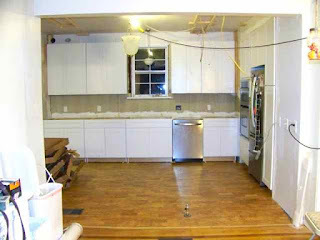 If you lay the level from one cabinet to another and it can rock at all then that will be a pressure spot for your countertops and can cause cracks (countertop installers check for this but it is so much easier if it is already done correctly before they get there). Using your shims you should be able to get it level and flush before you screw it into place. You also have to worry about flushness when you have a gap like for a dishwasher. The countertop extends the whole way so any time there is a gap, you need to make sure that the cabinets to the right and left of the gap are level with one another. Once all the cabinets are secure and you've double checked that everything is level, you can work on removing any part of the shim that sticks out from the base of the cabinet. Shims are designed so that if you score them with an exacto knife and then apply upward pressure, they will snap leaving you will the supporting part of the shim under the cabinet and the part that was extra no longer attached. Any gaps between the floor and the cabinets will eventually be covered up by the kick board. And there you have it! Completely level and secure base cabinets. The only cabinets left for us to be installed are the island cabinets (which are the trickest to install).